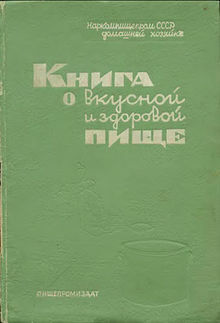 The Book of Tasty and Healthy Food (Книга о вкусной и здоровой пище, Kniga o vkusnoi i zdorovoi pishche) is a Russian cookbook written by scientists from the Institute of Nutrition of the Academy of Medical Sciences of the USSR. The cookbook was first published in 1939, and a further edition was published in 1952. An English translation (by Boris Ushumirskiy) appeared in 2012. Following the Russian Revolution, the official ideology promoted communal food preparation and dining, to maximise use of labour and resources and to liberate women to work. However, combined with widespread food shortages, this resulted in poor food quality and limited choice. Anastas Mikoyan, who was People's Commissar of the Food Industry of the USSR in the 1930s, became convinced that the USSR needed to modernise the way it produced and consumed food. He travelled widely, bringing many innovations back to the USSR, including the manufacture of canned goods and the mass production of ice cream. In the late 1930s, he spearheaded a project to produce a home cookbook which would encourage a return to the domestic kitchen. Prior to its introduction, the staple cookbook of Russian cuisine had been Elena Molokhovets' A Gift to Young Housewives, which had been published in numerous editions in late 19th- and early 20th-century Russia and remained in many households after the Revolution. However, as it had been aimed at middle- and upper-class households, it was frowned upon as being bourgeois. Moreover, many of its recipes relied on ingredients that were unavailable and techniques that were impractical in Soviet Russia. The new cookbook was thus aimed to become a reference work for the new Soviet cuisine. As with most publications at this time in the USSR, the cookbook had both a practical and propagandistic purpose. On the practical side, it contained recipes using modern techniques and foods and provided advice on diet, hygiene and etiquette. As propaganda, it began with a chapter on the successes of the domestic food industry and its recipes combined ingredients from across the many republics of the USSR. Moreover, as many of these ingredients were usually unavailable, the cookbook also served as an image of what the USSR aspired to be, a land of abundance and variation. Recipes range from the sumptuous (sturgeon in jelly, cold piglet with horseradish) to the everyday (cabbage stuffed with meat, bean soup). They were accompanied with lavish full-page illustrations of prepared dishes and food production. British chef Mary Berry modified and improved one of the book's recipes, which combined herring with egg, on her BBC 2 cookery program Easter Feasts (first aired April 13 2017). ^ a b c d Russell, Polly; The history cook; The Financial Times (FT Weekend Magazine), 17/18 August 2013, p36. Wikimedia Commons has media related to Cuisine of Russia.